Senators John Cornyn and Ted Cruz recently announced the names of the two students who have been selected as delegates to the 53rd annual United States Senate Youth Program (USSYP) that will be held Ma rch 7 – 14, in Washington, D.C. Jocelyn Hernandez-Vazquez of the STEM (Science, Technology, Engineering and Mathematics) Academy is one of two students across the state that will be part of the group of 104 student delegates who will attend the program’s 53rd annual Washington Week. 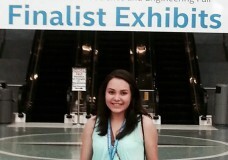 Jocelyn Hernandez-Vazquez has obtained a multitude of accolades throughout her academic career at the STEM Academy. Jocelyn serves as the district representative to the Mayor’s Fitness Council. The accomplished senior truly has a passion for leadership. She strives for excellence as the varsity debate captain, an international science fair competitor, and a non-profit founder. Even with these responsibilities, she is academically ranked number one in her class and has won the Gold Congressional Award for service. Jocelyn aspires to serve her country in public office. She will attend Harvard University in the fall. Each year this extremely competitive merit-based program brings 104 of the most outstanding high school students — two from each state, the District of Columbia and the Department of Defense Education Activity — to Washington, D.C. for an intensive week-long study of the federal government and the people who lead it. The overall mission of the program is to help instill within each class of USSYP student delegates more profound knowledge of the American political process and a lifelong commitment to public service. In addition to the program week, The Hearst Foundations provide each student with a $5,000 undergraduate college scholarship with encouragement to continue coursework in government, history and public affairs. Transportation and all expenses for Washington Week are also provided by The Hearst Foundations; as stipulated in S.Res.324; no government funds are utilized.